Browse: Home / AFF4 -The Advanced Forensics/digital evidence and data File Format. 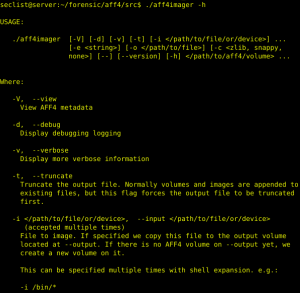 AFF4 -The Advanced Forensics/digital evidence and data File Format. 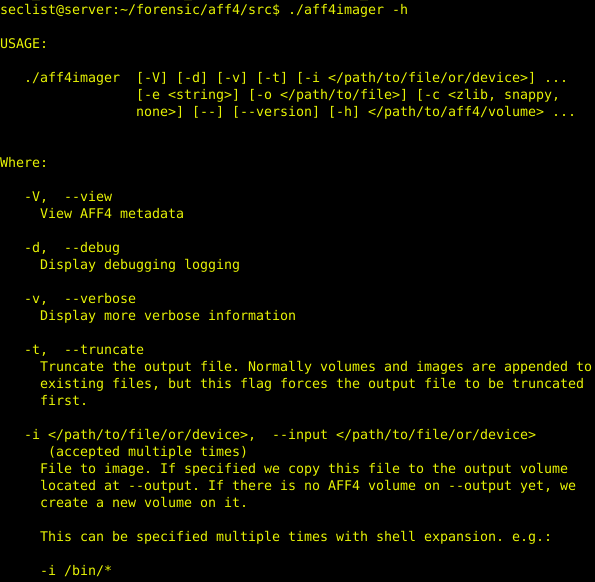 The Advanced Forensics File Format 4 (AFF4) is an open source format used for the storage of digital evidence and data. It was originally designed and published in  and has since been standardised as the AFF4 Standard v1.0, which is available at https://github.com/aff4/Standard . This project is a work in progress implementation, providing two library implementations, C/C++ and Python. + Reading ZipFile style volumes. + Reading AFF4 Image streams using the deflate or snappy compressor. 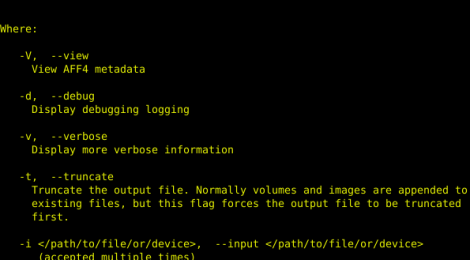 + Reading RDF metadata using Turtle (and in some instances YAML for backwards compatibility). Ignore the error about tree reference. $ ./configure CC=clang CXX=clang++ CXXFLAGS="-std=c++11 -stdlib=libc++ -O2 -g0 -I/opt/local/include" LDFLAGS="-stdlib=libc++ -L/opt/local/lib"
← sjet – a JMX exploitation toolkit.